Students of the Dispute Resolution and Public Administration programs participate in the Co-op program. 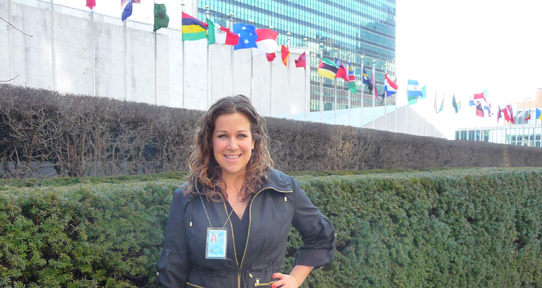 Here, Jane Harley is pictured on a placement she developed - at the UN in New York. When you attend the School of Public Administration, you will benefit from the expertise of faculty members who come from many different areas of scholarship, all focused on engaging with communities, advancing the cause of non-profits, and improving the public sectors. Our mix of graduate-level studies isn't found anywhere else... so neither should you be. Explore the options open to you in our Community Development, Dispute Resolution, and Public Administration Master's programs, as well as our Graduate Certificate and Diploma in Evaluation and PhD in Public Administration.